No need to spend too long on these, is there?! There are 44 minutes on the clock, Spurs are 1-0 up, and Chelsea have possession on the right of their midfield through Mikel. 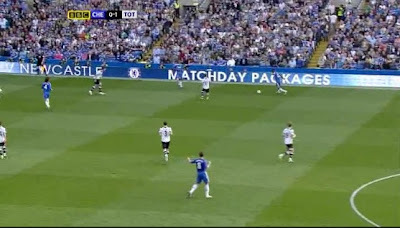 Van der Vaart works hard to stop crosses coming in – first from Mikel and then from Drogba. 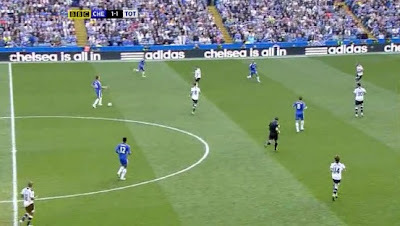 He pressures Drogba, but Drogba is able to step away from him, and he has Lampard as an option, just outside the centre circle. Lampard receives the ball, as Sandro comes across to press the ball. With no Spurs player close enough to stop the shot coming in, Lampard has a strike from distance. It’s straight down Gomes’ throat but bounces just in front of him and goes through his hands and legs. In making a desperate lunge to retrieve the ball, Gomes stops it just as it’s about to go over the line. 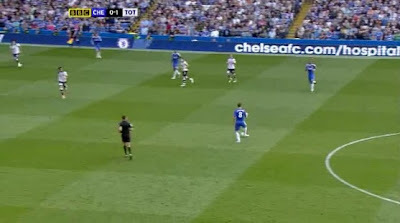 This shot shows just how far away the linesman is – his flag is easy to make-out. 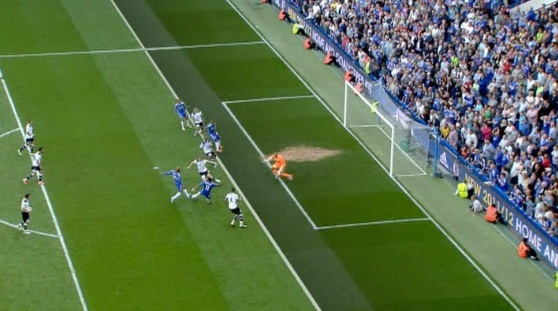 There is part of the ball clearly on the line and so, of course, the goal should not be given. A terrible, fundamental error from Gomes, but one that he retrieved. 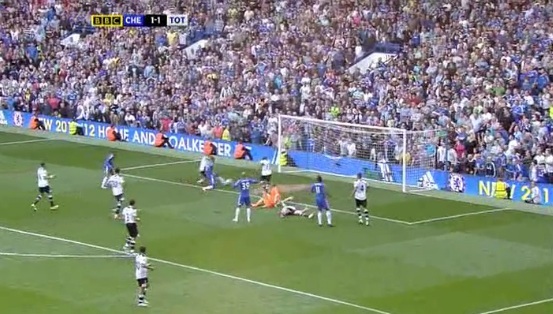 Terry pushes forward from defence as Chelsea’s pressure is starting to mount. Terry finds Anelka, who suddenly comes alive and accelerates forward. 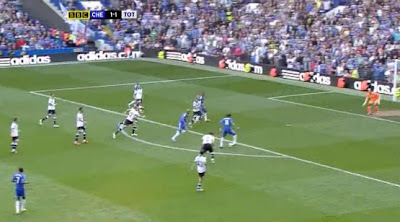 Anelka lays off to Lampard, and then makes a run to receive the return ball. 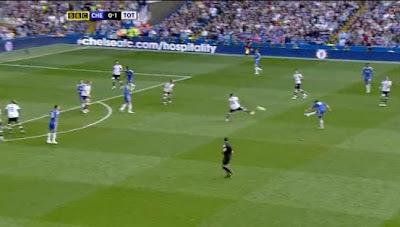 Lampard chips into Anelka’s pass, but it is not easy to control. It’s important to note that both Gallas and Dawson have stepped out at this point – they should not both be doing so here. I think Anelka tries to cushion the ball down for himself, but it falls nicely for Drogba. Kaboul comes across to challenge Drogba, but fails to make a proper challenge – Drogba fools him into thinking that he’s going to shoot, and instead cuts inside on to his left foot. Poor defending from Kaboul. 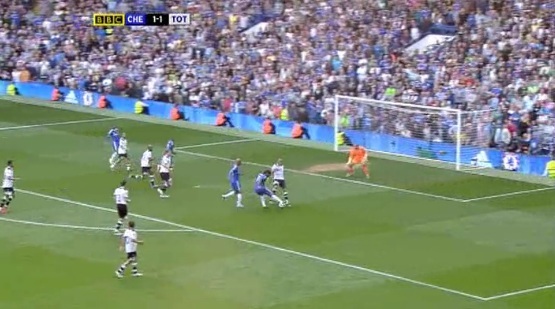 Drogba eventually gets a shot away, and Dawson throws himself at the ball. 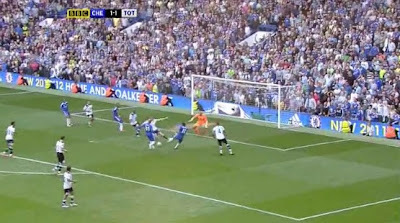 The shot is mis-hit, but falls absolutely perfectly for Kalou to stab home from inside the 6-yard box. 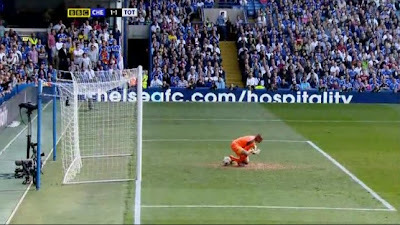 As Drogba took his shot, Kalou had strayed beyond our defensive line, and the flag should have been raised. 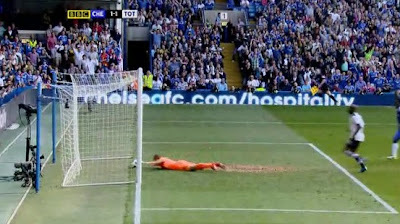 Another advert for goal-line technology, as 1-0 to Spurs at half-time would have made for a very interesting second half. That is not to say that every decision went against us – Chelsea should have had a penalty for Kaboul’s lunge in the second half. 1-1 would probably have been a fair result despite the under-performances of a number of our players; 2-1 was cruel, but pretty much sums up how our last couple of months have gone. I think that anyone who tries to defend Mr. Cairns, including Harry, is completely wrong. The ball didn't cross the line and so if Mr. Cairns declared that he was certain that he had, his eyesight, his judgement or his honesty is in question. In any of these cases, he is not fit to officiate at this level. If the ball had crossed the line and he had given no goal, nobody could have questionned his decision, as it was impossible to be certain from his position. To award the goal was simply incompetence of the highest order. 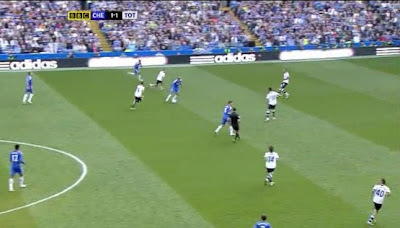 For the second goal, your stills leading up to the incident perfectly illustrate that Kalou was in an offside position for some time. The linesman can therefore not be excused because of movement or travel of the ball. 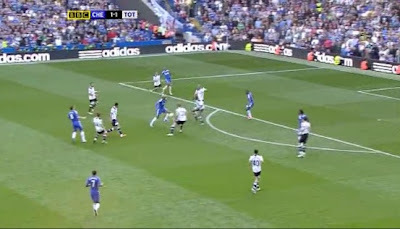 The play was compressed and he should therefore have been aware of Kalou's position throughout the build up. Anothe example of gross incompetence rather than human error. THE NEXT SPURS GAME I SEE HIM AT, I SWEAR I WILL RUN ONTO THE PITCH AND PULL OUT THOSE UGLY EYES. DOES HE KNOW HOW MUCH HE COST US? Well done! Excellent observation....then what?? 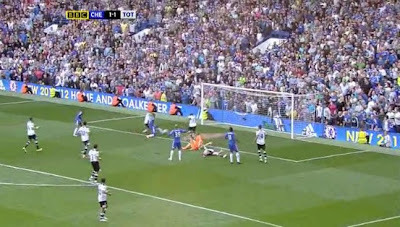 I am a Spurs fan and loosing to the Chelks in such manner is so painful. Then again, I do not see the positive side of it in terms of feedback. Maybe..., instead of analysing the "past match" I would rather suggest you to discuss the "next match". 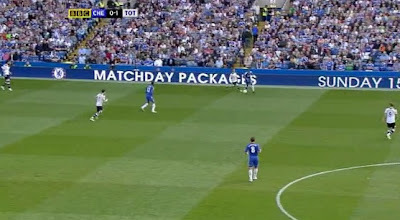 As you see it, our freekicks, corners, set-pieces are all sh**te. At the mo, VDV more often than not, is the only soul taking all these kicks and he royally wasted almost all of them!! Let me not start with our set-pieces...there aren't any!! Its either they've ran out of ideas or, they ain't have one at all!! Do this, with graphics if possible...you may never know, it may work wonders! Lets get behind the team, COYS!!! aqaljuta - interesting that you mention set pieces, I was considering a blog article on our set pieces. We are utterly useless at them whether they are crosses, shots, or otherwise. We know that Redknapp does not practice set pieces (confirmed by VDV) in training, which surely must explain why we're so poor. 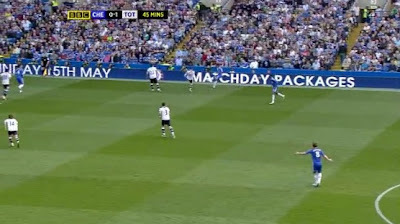 Good stuff as usual Windy but you've let Bale get away with some terrible defending when he stepped out to leave Drogba all alone on the 2nd goal further confirming that he's no left back!! Jonny - great point, he just totally left him, and was still stood on the edge of the box as the goal went in. I am guessing that this may have been due to HR's game plan to do a Mourinho and hit Chelsea on the break. This was illustrated by his response to Sandro's goal. I am astounded that we don't practice set-pieces. It's very evident in the chaos that ensues when we have to defend. This may explain why Gomes is so skitty. And on Gomes, do you think that he has been told to have soft hands to catch the ball better as in cricket. I think that he should do what comes naturally to most continental goal-keepers, punch! Sweetsman - great comments as ever. I had seen the Chalkboard analysis myself, and think it does go a long way to explaining Pavlyuchenko's display. His decision-making was very disappointing, but even if he'd been on top form, it would not have made a difference. I think Gomes must just not "get down" behind shots properly - possibly due to his unusual frame? Baffling. Was not a pen to them. Was it same or diff lino who ballsed up the two decisions? Wonder where there has been a game with two massively incorrect calls go against the same team? Thanks for the compliment, Windy. I agree with Bob: it was not a penalty as Kaboul did get the ball. I think that the referee got that right and it was not a case of evening things up. I just don't understand why we were so timid in the second half. Maybe this is emanating from the manager: is it he who lost some confidence? The comment has been made that HR doesn't know how to rotate a squad. This is unfair as the European odyssey has been a learning experience for all, shown to full effect against AC Milan at the San Siro, and so he will be gaining in experience. In the end, I think that this was our transition year and that next year we will be a force to be reckoned with. Much as I defend Pav, his lack of close control is baffling and I would have thought he would have built up upper body strength so that he isn't pushed off the ball so easily. I would not be surprised, however, if he stays and the other two go. I think that Odemwinge and Gian would be good recruits, but both will be away during African Cups. Both will be in their second seasons when most foreign players tend to reach their potential. I would love to see Marin come in as I think that Bale will only stay one more season. As for Berba returning, will he only start playing after Christmas? Sweetsman, Pav is not a world class player...I do agree with that but IMO he's the best striker Harry has at the mo. He's much better than Defoe and Crouchie. He shields well, has the ability to take shots from 20-25 yards out, runs the ball better, his left foot works as good as his right, quicker feet than Defoe & Crouchie too. Well, I guess his scoring rate speaks for itself. Yes, couldn't agree more, he's isolated. VDV played too deep in mid park whilst Modric (and I suppose Sandro too) is already there to pick up pieces, causing congestion in mid park and the link between VDV and Pav isn't there. I reckon Sandro is a good reader of the game, he timely back tracks and neutralises incoming attacks. Apart from that, he sees opportunity. Having said that, IMO, that could be the reason why Sandro tends to move a bit further upfront (to ease the congestion..maybe, and to pounce at opportunity as it comes) and he did and a pretty neat one too. Sad thing, he didn't get his "moment" after scoring his 1st PL goal, instead got told-off infront on 40 odd thousand fans! VDV is a talented lad, but I see him upsets the midfield most of the time. He is almost everywhere but his final ball dissapoints. He's a "go for glory" guy, not a good team player and causing a lot of inteference in mid park. Guess that's the reason why Jose Mourinho cannot see him fitting in his plans hence letting him go. I do agree too that our failure in our attacks and set-pieces (if they can be referred to as set-pieces...)often causing our backline being caught off-guard. Most of the time, we handle oounter attacks in chaos, chasing for the ball haphazardly and all in a sudden, everyone in the team becomes fullback. When the ball is cleared up top, there will no one there resulting in continuous attacks from all angles again and again.... Wonder if they've ever heard the word "basic football" or "simple football"? Stupid clearances all the time, they can even pick the nearest man to pass the ball and regain control. Daws apart of his brilliance, he always do it the difficult way (he panics? or what?). Somebody needs to tell him (and the rest of the lads at the back) play it simple, regain control and possession...that's key. Gomes, I still believe he is the best we have. I van recall anyone that's much better than him after Pat J era. I blame the men in front of him for allowing oppositions to take shots at the goal. Been seeing good defenders throwing their bodies to block shots. We didn't do that! haven't seen...not even once! The best they can do is to stick out a leg and hope the ball gets reflected away from the goal, if they are lucky enough! Hope Harry will sort things out!! VDV should stay in the opposition half with Pav to allow us an outlet and stop the opposition from coming too far forward. Also, having two players in their half could pull their defence apart if they are mobile: in this regard Pav is good, but the problem is that HR hasn't given him and Pav enough playing time. Defoe just stood around, gormlessly watching the play. I agree that Gomes is the best we have and I think that in the EPL only the keepers of our competitors are better. Fans, including commentators, get on his back too easily; the same goes for BAE. The recent supposition that he was shot mentally based on one photoframe at the weekend was just risible. His only weakness seems to be that he doesn't attack the simple ball when he has to move forward. I like Dawson very much, (heading, spirit, distribution these days) but his tendency to throw himself at the ball so often suggests that he is not in the right position to start with. He needs to close down more quickly and stay on his feet. Top defenders do not lunge in this way. Terry does but that shows that he is not a top defender. Carragher too. It looks dramatic but in Dawson's case it's only 50% effective.